This digital camera isn't just another midsized camera. 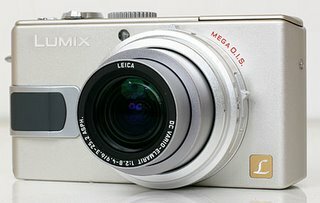 In fact, it has two features that make it stand out from most of the other digital cameras on the market: image stabilization and a 16:9 CCD (and an 8.4 Megapixel one at that). - unique 16:9 ccd allows for near-panaromic landscape shots. For the Flemish and Dutch people I have some good news. Your daily gadget news now in dutch on: www.gadgetflash.be. This mobile phone by Samsung is based on the success of the D500, which is voted to the best phone of 2005. The D600 has a 2 megapixel camera and a memory card slot for 512 mb. Sony is stepping up the picture quality of ultra-slim digital still cameras with the introduction of its new Cyber-shot® DSC-T9 model, the first in this category to offer both Super Steady Shot® optical image stabilization and high light sensitivity. 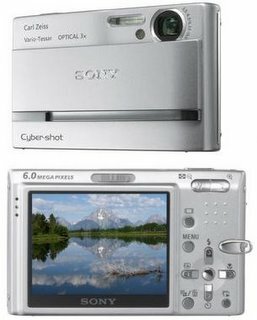 With these Sony technologies, the new six-megapixel DSC-T9 delivers more detailed images with significantly less blur and graininess than typical point-and-shoot cameras. Optical image stabilization reduces image blur from hand movement, while high light sensitivity helps to lessen blurriness resulting from low-light conditions. The end effect is better-focused, expressive images that look more like the way you see them, imitating the human eye. "Our T Series set the standard for slim, stylish, point-and-shoot cameras with fine image quality," said James Neal, director of digital imaging products at Sony Electronics. "Now the use of this category of cameras is pervasive. With the DSC-T9, we are taking this category a step further by incorporating advanced imaging technologies that ensure that you get the shot, even in unfavorable light conditions, like nightclubs and restaurants." Sony is the first manufacturer to incorporate an advanced lens-shift optical image stabilizer into a camera with a folded-path lens system. This is what allows for a compact form; the lens does not have to extend from the body of the camera.The model is equipped with a newly-developed lens-shift system with two gyro-sensors that detects hand movement, and automatically calculates the compensation needed to provide a clear, crisp image. The new model's high light sensitivity (up to IS0 640) allows you to capture clearer pictures in available light, giving you the option to not use a flash, which sometimes creates unwanted glare or harsh highlights. As a result, images have greater atmosphere and more detail, even when reflective surfaces like glass and mirrors are in the pictures. With a slim body less than one-inch wide, this compact powerhouse not only takes great pictures but also brings them to life with Sony's new Clear Photo Plus® LCD screen and slide show function. The 2.5-inch LCD features astonishing vividness and greatly improved color reproduction compared to previous models. It is the perfect screen to show off your pictures as a slide show, which the camera creates for you -- without having to use a PC. You can select up to four themes, such as "Stylish" or "Active," to play back your images, complete with dynamic transitions choreographed to your choice of music clips. Depending on your PC configuration, you can also upload your own music with the supplied software. The DSC-T9 camera offers mega resolution at six megapixels for high-quality images, a 3x Carl Zeiss Vario-Tessar® optical zoom lens, MPEG movie recording, and 58 MB of internal memory for storage and easy transfer to an optional Memory Stick® Duo or Memory Stick PRO Duo media card, now available in capacities up to two gigabytes. As with other T-series cameras, you simply slide the lens cover down and the camera is ready to capture images in seconds. Despite the power consumption of the optical image stabilizer, Sony's Real Imaging Processor® power management system helps this model to achieve exceptional battery life, up to 240 shots per charge. With the DSC-T9's slide show feature, sharing your photos right on the camera's LCD is more enjoyable. You can even connect directly to your television with supplied cables. However, if prints are what you want, then you can connect the model to a Sony DPP-FP50 digital photo printer and print from the convenience of your own home. Don't think that you're limited to basic prints with this camera; you can even create postcards or calendars using the printer's supplied software. Perhaps you need to print tens or even hundreds of pictures, or want to share funny video clips, then there is the option of using Sony's online photo service. At www.imagestation.com, you can create your own online photo and video albums, order prints, or make customized gifts from coffee mugs and photo books to calendars and T-shirts. The Cyber-shot DSC-T9 camera will be available in January for about US $450 online at SonyStyle.com, at Sony Style retail stores (www.sonystyle.com/retail) and at authorized dealers nationwide. Pre-orders begin on Nov. 1 at www.sony.com/T9. The camera is supplied with an InfoLithium™ battery, battery charger, multi-connector cable, wrist strap and software CD-ROM. Optional accessories include the Cyber-shot Station™ cradle for about US $80, a sports pack for about US $100, and leather carrying case for about US $40. Nokia announces convergence devices for mobile TV and the digital home at Nokia Mobility Conference 2005. Today, at the Nokia Mobility Conference 2005, Nokia illuminated its convergence strategy by extending the Nokia Nseries multimedia range to include three new devices: the Nokia N92 (the world's first mobile device with a built-in DVB-H receiver), the Nokia N71 and the Nokia N80. With these new devices consumers can wirelessly watch mobile TV, stream music, share photos and send emails with attachments, using technologies such as 3G, WLAN and Universal Plug and Play (UPnP)*. This latest launch follows the announcement in October of the Nokia Eseries, a new family of Nokia smartphones targeted at the business world. The Nokia Nseries, first launched in April, and the Nokia Eseries are the manifestation of Nokia's vision of convergence and the emerging digital industry, bringing together information technology, enterprise applications, broadcasting, music and imaging. Speaking at the Nokia Mobility Conference, Nokia Chairman and CEO Jorma Ollila explained how devices like these lie at the heart of digital convergence. "We expect the market for convergence devices to double to 100 million units in 2006. Developers, media companies and enterprises are shifting their focus to Nokia's S60 smartphone platform, as they see the business potential of using it to offer content and ensure secure remote access to corporate applications," said Ollila. "Convergence is opening up a world of opportunities for our customers and partners, and Nokia is committed to developing the tools, solutions and products to make the promise of the digital industry a reality." The Nokia N92 is the world's first mobile device with a built-in DVB-H receiver, making it possible for users to watch and record live TV at any time. Based on open standards, DVB-H is the leading mobile-TV broadcasting technology, enabling low-cost delivery of high-quality broadcast programs to mass audiences. The Nokia N92 features applications and functionalities that make it easy for users to watch and search for TV programs, create personal channel lists, subscribe to TV-channel packages, set program reminders and access interactive TV services. The ergonomic form factor includes media keys, a view mode and a large (2.8") anti-glare QVGA screen supporting 16 million colors. The latest member of the Nokia XpressMusic family, the Nokia N71 is a pocket-sized entertainment system complete with stereo FM radio and support for digital music and videos. The Nokia N71 also features the new Nokia Web Browser with Mini Map. This allows a semi-transparent, zoomed-out view of a web page, so that users can quickly orientate themselves on a handset screen. Equipped with WLAN and 3G, the Nokia N80 is the world's first handset to feature UPnP technology. This allows it to be used as a remote control for wirelessly swapping content between compatible PCs, audio equipment and TVs. Images and video stored on the Nokia N80 or on a compatible PC can be viewed on a TV, for instance, while music stored on the device can be played through an audio system. Nokia N80 users can also print wirelessly to any UPnP-enabled printer. In addition, the Nokia N80 supports most commonly used email solutions and office-application formats. At the conference Nokia also unveiled a new web browser for its S60 software for smartphones. The browser, designed to give equal access both to full web pages and mobile-optimized content, is available for S60 licensees as part of the S60 3rd Edition offering. With the browser built on open architecture, S60 licensees and open source developers will be able to extend its core and build new features on top of it. In keeping with this open source approach, Nokia has also launched a new Internet portal for its open source software projects: opensource.nokia.com. The portal, a natural extension for the Forum Nokia online developer community, consolidates Nokia's open source activities and provides access to its projects. The new Nokia Eseries family of smartphones for the business world also made its public debut at the conference. The Nokia E60, the Nokia E61 and the Nokia E70, each with its own distinct design, are built on a platform that meets the security and manageability needs of corporate IT professionals. The Nokia Eseries is targeted at companies and public institutions that want to improve their performance while keeping the cost of device management and support under control. Nokia Eseries devices support all GSM bands, 3G, WLAN, corporate email access and advanced voice functionality (including IP PBX connectivity over WLAN), and offer integrated security features and tools for device management. Multiple email solutions are supported, including BlackBerry Connect, GoodLink, Nokia Business Center, Seven Mobile Mail, Seven Always-on mail and Visto Mobile. Nokia Eseries devices are a perfect fit with the Nokia Business Center, a robust and cost-effective solution for the mass-market rollout of corporate mobile email. Nokia has also introduced the small, modular and high-capacity Nokia Flexi WCDMA Base Station. Built on a completely new platform, the Nokia Flexi WCDMA Base Station enables operators to make more efficient use of their base-station sites, reducing site costs by up to 70 percent. In addition to supporting WCDMA and High Speed Packet Access (HSPA) technologies, the base station's future-proof architecture, compatible with Open Base Station Architecture Initiative (OBSAI) specifications, will later allow operators to rapidly deploy new technologies, such as WiMAX. Shams Tarek has reviewed the canon PowerShot S80. It's a fun little camera that packs a wallop in terms of features, performance, and photo quality, he says. You can find more details about this gadgets here. Today ViewSonic announced a new VX series LCD display, the VX 922. This LCD display has a response time of 2ms. The company claims the new monitor (19 inch) has world fastest response time and guarantees this monitor won't feature any ghosting. The ViewSonic VX 922 display will be available from Dec. 1 for $ 429. Read more at DV Hardware. Samsung Telecommunications America (Samsung) today announced the availability of the multi-functional designed SGH-d307, which features a swivel display that morphs the clamshell phone into a virtual mini-laptop. With a quick flip of the screen, the d307's numeric keypad becomes a full QWERTY keyboard, unveiling a productive messaging device for users to send and receive emails and instant messages on the fly. The d307's large internal display features a 262K-color TFT screen, making it easy to view and move from one message to another. Its integrated EDGE technology takes advantage of faster connection speeds, allowing quick and efficient browsing of HTML pages and navigation of emails, and the internal antenna keeps the lines of the device smooth and unobtrusive, without compromising network reception. Packed with an array of advanced communication features, the d307 includes advanced voice recognition with VoiceMode™ speech-to-text dictation technology and voice-enabled dialing, as well as a speakerphone and Bluetooth® wireless technology support. Additionally, the phone includes multimedia messaging for sending pictures, animation and sound files. "The d307's breakthrough design showcases Samsung's ability to embed real-life, relevant technologies in sleek, user-friendly packages," said Peter Skarzynski, senior vice president, Samsung. "With the increased popularity of messaging, products such as the d307 will resonate with consumers, meeting their ultimate communication needs." 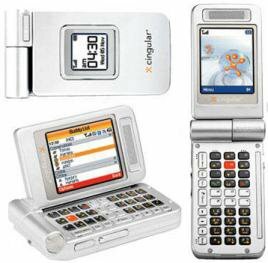 The d307 is available at Cingular Wireless retail stores, in select markets throughout the U.S., for $149.99 with $50 mail-in rebate. For more information visit www.samsung.com. Sprint Launches the First Instant, Over the Air Music Download Service in the U.S.
Sprint customers will be the first wireless customers in the U.S. to download full songs over-the-air. Today Sprint announced the opening of the Sprint Music Store(SM) powered by Groove Mobile, the first music store in the U.S. that lets wireless customers browse, preview, download, play and manage high-quality digital music, right from their phone. Sprint customers can now take their music with them on the go and have instant access to purchase and download music when they want to, not just when they are in front of a PC. Sprint Music Store customers can browse, preview and purchase hundreds of thousands of songs from virtually every genre of music from EMI Music, SONY BMG MUSIC ENTERTAINMENT, Warner Music Group and Universal Music Group. For $2.50 a song, customers get two copies of the song: one high-quality version formatted to play and enjoy only on their phone and another high-quality version formatted to download on to their PC. Customers can also burn their music to a CD using Windows Media Player. "Sprint is the first carrier in the United States to deliver what customers want most in a wireless music store – the instant gratification of downloading and owning their own personal collection of high-quality songs on a device that is always with them," said Len Lauer, chief operating officer for Sprint Nextel. "Sprint is delivering on-the-go entertainment through a music storefront that is customer-friendly and easy-to-use. With a single click, customers can access the Sprint Music Store and more than 250,000 songs from all four major music labels. And because their phone is always with them, now so is the music they want." The Sprint Music Store operates on the high-speed Sprint Power Vision(SM) Network and is now available on two new multimedia phones, including the Sprint Power Vision Phone MM-9000 by SANYO and the Sprint Power Vision Phone MM-A940 by Samsung, also announced today. When on the Sprint Power Vision Network, customers can download a full-length song in as little as 30 seconds. The Sprint Music Store includes both a Store and Player. The Store allows customers to browse, preview and buy digital music. The Player allows customers to view their music by genre and by artist, as well as play and manage their music using playlists. It also allows customers to bring music from their PC over to their phone. Sprint Power Vision phones come packaged with a high-quality stereo headset that enables customers to enjoy music privately. Or, if they prefer, they can play their music on the built-in speakerphone without the stereo headset. Sprint Power Vision phones come packaged with a removable memory card that is inserted in the phone to buy, download and play full songs from the Sprint Music Store. Using an optional 1GB removable memory card, customers have the ability to store up to 1000 songs purchased from the Sprint Music Store. "We expect that Sprint will introduce many customers to their first experience with downloading digital music on a Sprint Power Vision Phone, similar to how many customers first used a digital camera via their Sprint Phone just a few years ago!" said Lauer. 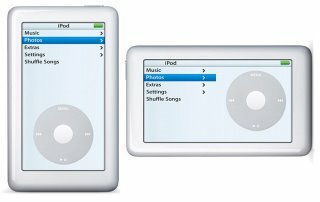 cnet.com reports 5 reasons why the 20 GB photo is a better iPod than the new one. "Mobile professionals and consumers alike have come to expect the most cutting-edge mobile technology from Motorola and with the i870 we are delivering a device that is unlike anything else on the market today," said Peter Aloumanis, director, U.S. Markets Division, Motorola's iDEN(R) MobileDevices. "The Motorola i870 combines communication and entertainment in one unique handset that gives users the ability to take pictures, record important moments and play their favorite music. 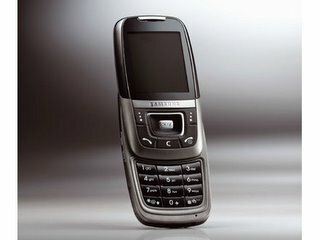 In addition to its distinctive combination of mobile features, the i870 handset incorporates the protective AgION antimicrobial technology." -- Music Player. This allows users to play MP3 audio files stored on either the memory card or the phone even when the handset is closed. -- Removable Memory Card. This Transflash card enables users to save media including music, video and pictures on a removable card available at various sizes (128MB, 256MB and 512MB). -- Wide Integrated Digital Enhanced Network (WiDEN). WiDEN enables users to send and receive data up to four times faster than the current iDEN network. "We are excited to work with Motorola to incorporate AgION's patented antimicrobial technology into the i870 handset," said J. Ladd Greeno, president and CEO of AgION. "Silver has a centuries-long history of use as an antimicrobial and our compound has been incorporated into a variety of applications including apparel, pens and even medical devices. The built-in antimicrobial coating of the i870 will help to ensure effective and long-lasting protection of the handset from damaging microbes." retail stores, at a price of $299.99, with a two-year service agreement, new activation and credit approval. Taxes, fees, early termination fee and other charges apply.